Director Shankar is busy with his Ai with Vikram and Amy Jackson which he plans to release in the beginning of 2014. In a recent interview, the director whose success rate is easily the envy of many, opened up on many subjects. When he was questioned about the recent films that he really loved, the Anniyan director immediately said ‘Moodar Koodam’. He states, “Moodar Koodam is impressive and intelligent. Director Naveen has made the audience think in every scene in the film. It is very definitely a smart attempt”. He further adds that Moodar Koodam would have very easily fitted into the kind of films he would have wanted to produce with S Pictures. 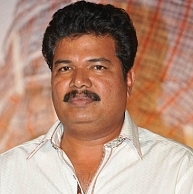 Shankar also says that he would have loved to fund films like Moodar Koodam, Soodhu Kavvum and Naduvula Konjam Pakkatha Kaanom as such films are the ones which provide oxygen to the industry. Coming from such a prolific director, the crew of these films should really feel proud! Ajith and Gautham Menon together - All decks cleared? People looking for online information on Ai, I, Moodar Koodam, NKPK, Shankar, Soodhu Kavvum will find this news story useful.